"Epiphone Zakk Wylde Les Paul Custom"
"Epiphone Zakk Wylde signature with a new graphic"
its not a gibson.there is nothing bad i could say about it really. the quality and build of this guitar is awsome,it is beautiful in every way,from the maple neck to the bound edges of the body to the mother of pearl inlays.i have had this guitar for nearly a year now and i have not had one problem with it.it plays 101% all the time. 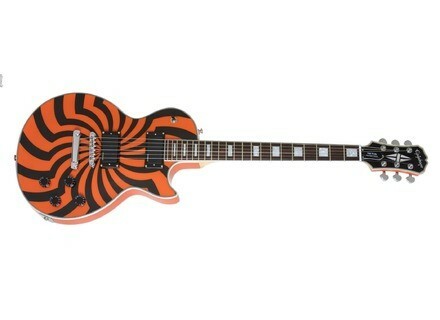 if you like zakk wylde and les pauls go out and buy it,its worth every penny.